The silver Deluxe Varipole Support System from Impact is a kit that provides you with a complete studio system for shooting everything from portraits to product shots. The kit includes two silver Varipoles as well as two Triple Background Hooks with Superclamps and one each of gray, black and red Chain Sets and Weights. The multi-colored chain sets will help you distinguish each of your backdrops and eliminate any mistakes when you want to change the color of the background. The system will accommodate three user-supplied backdrops. The beauty of this system is that you'll be able to exchange the backdrops without having to dismantle the entire system to re-hang a backdrop. This saves time and makes your shooting session more cost-effective and time-efficient. It also allows you to give your client three different "looks" to the shot. Set up is easy since the Chain Drives provide a quick way to raise and lower your backgrounds. The Varipoles grip the floor and ceiling securely. The Varidrives are placed within both ends of your background and expand to fit tightly. This entire system gives you an entire studio set up in one complete package. All the components for a home or studio background system are included. All you need supply are the backgrounds. The adjustable Deluxe Varipole Support System (Pair) from Impact offers two Varipoles to create a functional studio backdrop and grip system. The Varipole easily and quickly mounts between floor and ceiling providing stable support for backdrops, reflectors, lights and grip accessories. With a strong tension mechanism and locking system, the Varipole is secured by its own force of pressure between solid walls or floors and ceilings. Adjustable between 6'11" (2.1 m) and 12'1" (3.7 m), the Deluxe Varipole is capable of turning most rooms into a photo studio without damage to walls or ceilings. The Varipole is available in black powder or brushed aluminum silver finishes. 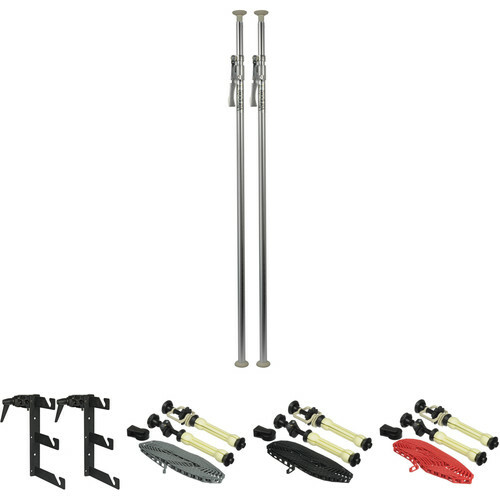 This Varipole set comes with two Varipoles of the same color at a budget-friendly price and will allow you more capability and load bearing strength. Purchase a cross-bar to hang a complex lighting set-up for portraiture or even stage lighting. Adjustable between 6'11" (2.1 m) and 12'1" (3.7 m). Solid rubber cushions give no-slip grip and minimize marks and damage to walls, floors and ceilings. Extension poles of 59" (1.5 m) and 78" (2 m) are available separately to increase the length of the Varipole. This is a set of two black Triple Background Hooks with Two Super Clamps from Impact. This system allows you to hang up to three rolls of seamless on your optional background support system. The two Super Clamps attach to the uprights of the support system and two Triple Hooks attach to the Super Clamps using the included hardware. Part of the Varidrive system for easy raising and lowering of seamless paper, the Varidrive with Gray Chain from Impact has adjustable inserts that tightly grip each side of the various sized seamless paper rolls. The Varidrive is then inserted into hooks like the Impact ME-122, ME-123 or the triple hook VPD-H3W. With the exception of ME-122 which fits in a Super Clamp, the other hook sets are bolted onto the wall. You can load three rolls for example, onto the VPD-H3W. Each roll requires another Varidrive kit. You can purchase color-coded units to clearly identify which roll you're raising and lowering. The Varidrive can handle seamless rolls measuring up to 9' wide and weighing up to 22 lb. To strengthen large coreless rolls and prevent bowing, Cross Poles (VPC-5) are available from Impact. Part of the Varidrive system for easy raising and lowering of seamless paper, the Varidrive with Black Chain from Impact has adjustable inserts that tightly grip each side of the various sized seamless paper rolls. The Varidrive is then inserted into hooks like the Impact ME-122, ME-123 or the triple hook VPD-H3W. With the exception of ME-122 which fits in a Super Clamp, the other hook sets are bolted onto the wall. Part of the Varidrive system for easy raising and lowering of seamless paper, the Varidrive with Red Chain from Impact has adjustable inserts that tightly grip each side of the various sized seamless paper rolls. The Varidrive is then inserted into hooks like the Impact ME-122, ME-123 or the triple hook VPD-H3W. With the exception of ME-122 which fits in a Super Clamp, the other hook sets are bolted onto the wall. Box Dimensions (LxWxH) 87.0 x 8.5 x 4.5"
Box Dimensions (LxWxH) 13.9 x 10.2 x 4.15"
Box Dimensions (LxWxH) 13.8 x 5.35 x 5.1"
Box Dimensions (LxWxH) 13.7 x 5.3 x 3.4"
Box Dimensions (LxWxH) 15.3 x 6.35 x 5.3"
Deluxe Varipole Support System (Silver) is rated 4.5 out of 5 by 20. Rated 5 out of 5 by Harold from WORTH EVERY PENNY AND THEN SOME! Worth every penny. A nice lower cost alternative to the Manfrotto autopoles which are about $200 more. These have the same mechanism - spring locked tension rods, and are super easy to setup. Because of these auto poles, I've been able to save close to 2-3 feet of floor space as typical cheap tripod-based backdrop kits extend over a foot in each direction. I also purchased 3 Cross Poles accessories at $30/ea but am not using them at the moment as I didn't realize that they aren't adjustable! A cheap trick: Go to IKEA and pick up their HUGAD curtain rods. They come in two sizes - 4ft-8ft and 8ft-12ft ($4 each) and will fit snug in the triple background hooks which support the backdrops. Voila, an easy way to hang and roll up your MUSLINS or VINYL (seamless paper will need the stronger cross poles because of the weight) and you can adjust your Varipoles to just about any width you'd like, a great space saver! Rated 5 out of 5 by Carol H. from I would buy this product again!! This was extremely easy to set up and didn't really take any tools except what came with it. As a female photographer some things can be a really challenge to put together/set up. This was very easy and the instructions were very clear. The pulley/chain system works well and love having the ability to easily switch backgrounds during a shoot. I'm thinking of adding a second one to my studio space to give me more options as well. The only draw back is you have to buy additional cross bars if you aren't using paper rolls. Other than that it's great. Rated 5 out of 5 by Shavella from Superb This is the greatest investment I've made for my newly opened business. The pulley system has made changing backdrops so easy for me since I am usually working alone. I AM IN LOVE WITH THIS PRODUCT! Easy set up and breakdown and it makes my tiny studio space look so clean. It fits perfectly in my space and I just can't stress how much this product has increased productivity and creativity. Great! Rated 5 out of 5 by Irene A. from Love it Love it. It was easy to install and works like a charm. I purchased 3 12' Manfrotto Alu-Core crosspoles to go with it, because I wanted to mount 9' seamless rolls, while having the varipoles be 12' apart. Then just stuck a little paper/wad of tape in between the crosspoles and seamless to make it tight enough that the pulleys would still work. I do wish that there was an option to have the three hooks mount in-out instead of up-down. Our ceilings are only 8' so the bottom two backdrops are not taking full advantage of the ceiling height. I wish they made hooks that could mount away from the wall instead of along the wall, so that each backdrop could have a full 8'. That's my only recommendation! Rated 5 out of 5 by Liv B. from Great system! I just got this system last week and am loving it! Was easy to set up and easy to use. Have done a couple of shoots with it so far and find it to be much faster to get my paper up and down than what I was using previously because of the pulley system. Definitely recommend this item! Rated 5 out of 5 by Tekphoto from Impact Deluxe Varipole Support System This works and looks great in my studio! Instead of mounting on the walls and damaging them, It's smarter to use this system instead. The chain driven mechanism works great. The quality is top notch. Thank you for selling this great product. I'm a satisfied customer! Rated 5 out of 5 by Victoria K. from Fantastic Backdrop System I have used this system on both carpet and laminate and it works great. My husband and I set it up in less than an hour and it worked like a dream. The only critique I have is that the instructions didn't mention how to tighten up so the rolls didn't come undone, but a simple google and I figured out that the opposite side of the chains has a know that can be tightened. Overall, works great and wish I had purchased it earlier.